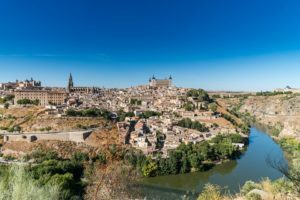 Spain travel itinerary: This page gives information on Spain Travel Itineraries and England to Spain travel. You may find that I have tried to include short itineraries (less than one week) rather than long ones. The reason for that is, you need more careful planning if you have less time on hand. So, I have tried to give you some idea of what is possible in the number of ‘minimum’ days I suggest. If you are planning for many days stay, you can do much more (and spend more!). Spain is a big size country compared to many European. The most popular destination is on the southern or eastern sides. If you want to visit Spain, I would suggest the following two itineraries. It covers Barcelona, Montserrat, Tossa de Mar(Beach), Laurette de Mar (Beach). Day 1 – Travel to Barcelona. Day 5 – Tossa de Mar(Beach), Laurette de Mar (Beach). You can take a bus from the square near the main tourist information center at one end of Ramblas street. As all of the sights and places on this itinerary can be easily reached from the city center of Barcelona, you can rent an apartment in any district of your choice, and use this as an easy starting point for the suggested day trips and discovery tours in and around the city. This is a 6 or 7 days itinerary depending on when you reach on day 1. It covers Granada, Cordoba, Saville (It’s a triangle). If you have insufficient time and can cover only two places, drop Saville. Day 1 – Travel to either of the above airports else nearest big airport on the north is Madrid. From European countries, you can also fly into Malaga on the south. Goto Granada. Day 3 – Granada. Take a bus to Cordoba in the evening. Day 5 – Cordoba. Take a bus to Saville in the evening. Day 7 – Saville. The flight back in the evening. If you get more time, do visit Ronda, Malaga etc. If you want to mix above two itineraries and cover Barcelona, Granada, and Cordoba, consider taking an overnight train from Barcelona to Granada to save time. It’s a long distance. Else, take an internal flight.